"Imitation is the sincerest form of flattery" so goes the saying. Cover songs are the best way to pay tribute to excellent musicians and songs. Some straight up copy the tune, some take it and tweak it to make it fresh and new. Since MJ's untimely death, I've noticed folks posting Michael Jackson covers in every style from Mariachi to ballad-esque. Here are some of the most interesting covers I've seen. Disclaimer: Just because you put on the sequined jacket, it doesn't mean your version of an MJ song is going to be good. Put on the jacket and make it your own. Make it interesting. - Does the artist make the song their own? - Does the artist keep the integrity of the MJ original? - Last but not least, is the cover fun to listen to? I know, I know, this report is months overdue, but I figure better late than never. And since these pictures are pretty good for what I can do with my little Canon Power Shot, I wanted to share them with you. I am not embarassed to say that I am a Queensrÿche fan. Even though I mostly listened to classic rock and 60s folk rock in high school, something about Queensrÿche's album Empire grabbed me in the early 90s. My older brother gave me his tape and CD because he was soooo over it. But I listened over and over and over. 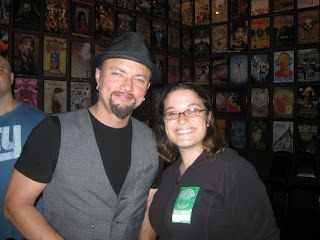 Was it Geoff Tate's insane soaring vocals? Was it the intricate arrangements and guitar lines? What about their unabashed political statements? As a girl whose music tastes were somehow stuck in the 60s, this strange world of Seattle progressive metal was bizarrely appealing to me. In 2004 Queensrÿche toured through Austin, Texas (where I lived at the time) performing their rock opera Operation: Mindrime. I jumped at a ticket. Yes it was expensive and I went alone since I couldn't persuade anyone else to go with me. "Queensrÿche? You like them?" people would say. Yes, I'm crazy. The fans were fascinating, especially these Texan fans. I've never seen so much faux-leather spandex in my life. Metal fans are awesome and the music was not disappointing. The guitars sounded great and Geoff Tate sounded better than ever. This is what singing is all about. Queensrÿche came through Austin again in 2007 peforming both Operation: Mindrime I and II with theater sets, costumes and props. By then I had met a friend curious enough to come with me and we had a great time. 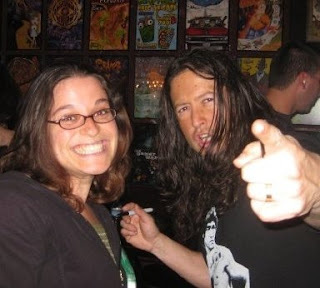 I saw that Queensrÿche was playing the Fillmore at the beginning of June and I jumped at this show too. They have a fascinating new album out called American Soldier based on recorded interviews conducted by lead singer Geoff Tate with men and woman who have served our country. It was inspired by Tate's father who served in Korea and in Vietnam. Tate told the Fillmore audience that his father never liked talking about his wartime experiences but got him to talk in an interview. This album is not an anti-war album, it's a pro-soldier album. Tate stated that Queensrÿche has many fans in the armed forces and appreciates what they've done for the United States and "allow us to live the way we live." Earlier this spring they scheduled Military Base Signings open to service men and women only. These are snippets of Tates's stage banter and photos from the Queensrÿche San Francisco show at the Fillmore on June 4th, 2009. A highlight of the show was this moment when Tate's stunning 11-year-old daughter Emily joined her father on stage for "Home Again" a song about a series of letters between a father at war and the daughter missing him. "Vietnam veterans came home to a very divided country. They were called 'baby killers' and people spat in their faces. We've come a long way since then." "The album Empire is about the war on drugs. [Since the song was written 20 years ago] the money spent on this war as quadrupled. It's obvious that we don't need more money, we need new ideas." Tate reminised about listening to Queensrÿche on vinyl records and appealed to Bay Area mentality. The audience cheered. "Are cheering because you like vinyl?" he asked "You mean you like the idea of people being made to sit and actually listen to music? Wow. I'm giddy. 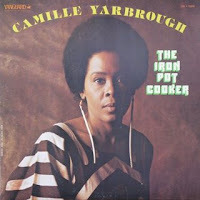 The record industy must have it wrong (with mp3s)." After the show I had the honor of meeting the band. They signed my ticket stub! Check out the the wall of Fillmore posters in the back. I take sleeping in on weekends very seriously. But sometimes it's worth getting up at 8:30 AM on a Sunday morning, especially if you know that you're going to witness an intimate performance of a popular band in a park! Take yesterday: I got up and headed over to San Francisco to see the band Ra Ra Riot perform a live set in Golden Gate Park. The event was part of a "Live and Local" series thrown by SPIN earth tv "A voluminous new music site with correspondents from 6 continents who are producing videos, articles and photos about their music scenes." I just heard about this site and am now following them on twitter. After wandering around the Conservatory of Flowers in Golden Gate Park for a couple minutes wondering where the crowd was and wondering if it was all a cruel joke (and seeing some other folks doing the same) I found the crowd in a meadow to the east through the trees. Ra Ra Riot and Spin earth tv had brought along free bagels, donuts, fruit and coffee. I'd say there were about 50 people there. Everyone looked half awake (I'm sure some of them were at the Greek Theater the night before to see Ra Ra Riot and Andrew Bird open for Death Cab for Cutie). I'm not too familiar with Ra Ra Riot, but since I like free stuff and I like the park, I thought this would be worth my time. It turns out that the cello was broken, so the band could only perform two songs. It was sad, but it was nice to hear some music that early in the morning, especially from a band of their stature. I'm still wondering if only those two songs were playable without the cello, but like I said, I don't know their music that well, so maybe. But it was still worth getting up. These are two short video clips I took of "Each Year" - sans cello. If you want to see the full performances, I've reposted this on examiner.com with someone else's footage. Girl in a Coma is probably the most inspiring band I've come across in awhile. Hailing from San Antonio, these three Latinas have already taken over Texas. Now they're off to conquer the country. And right now they're on their way to the west coast! I find Girl in a Coma extra inspiring since they are supporters of Girls Rock Camp Austin, Texas, where I first saw them perform. They have won the respect of Joan Jett, who signed them to her label Blackheart Records and Morrissey, who they toured with last year. To me they embody everything that Girls Rock Camp represents: talented female musicians playing straight up, hard rocking music while being true to themselves and having fun. 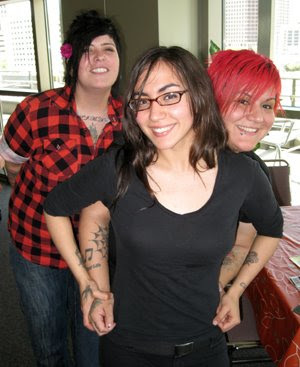 Girl in a Coma is sisters Nina (vocals/guitars) and Phanie Diaz (drums) and friend Jenn Alva (bass). Phanie and Jenn played together in high school and were always looking for that last link. Little did they know that the last link was Phanie's 12 year old sister Nina. Now almost a decade later, Girl in a Coma has just released their second studio album Trio B.C. named after the Diaz sisters grandfather's tejano band. Always More to Hear has made it to the big screen! I thought this would be very meta... pictures of the blog on the blog. For those of you who teach using youtube videos, this is a great way to get everything in the same place. Putting everything on a blog was very helpful. This way, campers can go back to the entry, watch the whole video and learn more if they want to. One of the Girls Rock staff members borrowed a digital projector from a friend, so all we needed was internet and a computer. We also got the audio patched through the PA so the music was nice and loud. Big Mama's Hound Dog sounded really good. For the most part the campers seemed to like the workshop, it gave them some down time to basically sit and watch tv. Who wouldn't like that? I hope I get to lead this workshop next year, it's really fun. Martha and the Vandellas "Dancing in the Street"
Dolly Parton and her "Coat of Many Colors"
In honor of Girls Rock Camp this week occurring in Oakland this week, I am celebrating women in music, past, present and future. Today I want to celebrate Bessie Smith, definitely one of the greatest influences on women (and men!) in music today, and possibly the first music video star as well. But first, let me tell you what's happening at the second day of Girls Rock Camp: the 70 campers or so will learn more of the basics of their chosen instruments, whether it be the bass, turntables, drums, guitar, keys or vocals. The girls will also continue to pick band names and write a song that they will perform for a live audience this Saturday at 2pm at the Oakland Metro Opera House. 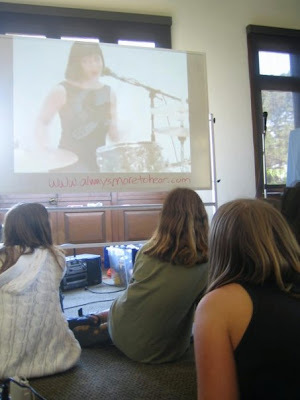 Follow the Bay Area Girls Rock Camp live blog. After lunch they will learn how to make a zine and participate in a history of women in rock workshop, taught by yours truly. 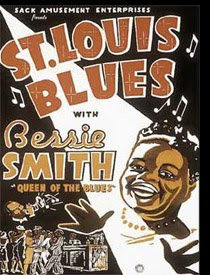 Bessie Smith is the first woman we will talk about and the video we're going to show the campers is part two of St. Louis Blues made in 1929. We want to showcase her powerful voice. See what other famous women in rock we will talk about in our Girls Rock Camp workshop here. It got me thinking about what this video actually is. I have this way of using youtube just for the audio, but the sometimes the video is just as interesting (or bizarre or hysterical) as the audio itself. 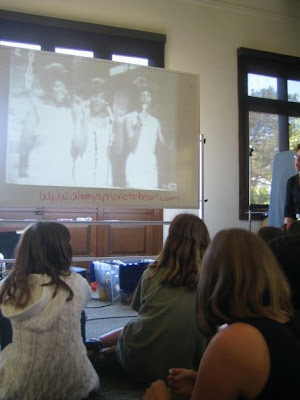 Welcome to Jennie and Jamie's "History of Women in Rock" workshop for The Bay Area Girls Rock Camp! We will be leading this workshop for the first and second session of camp this year, but this information will be around for you to see when camp is over. Feel free to watch these videos and click on the links (colored and/or underlined) to learn more about the women that inspire you. There are so many amazing women who have brought us so much music we couldn't include everyone, but please click on the bottom of this post where it says "comments" and tell us what you think. Barbara Lynn - "You'll Lose a Good Thing"
Heart, Nancy and Ann Wilson - "Crazy On You"
Aretha Franklin - "Look to the Rainbow"
Kim Gordon of Sonic Youth - "100%"
D'arcy Wretzky of the Smashing Pumpkins - "Cherub Rock"
Maureen "Moe" Tucker of the Velvet Underground - "Fired Up"
Gina Schock of the Go Go's "We got the Beat"
Why girls? 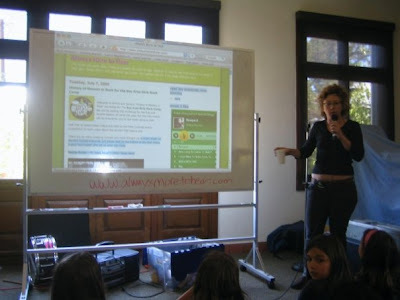 Why a Girls Rock Camp? Someone has actually asked me that. Have you ever watched Mtv? (Especially now that it only schedules reality television.) Have you seen the dozens of blatant sexualized covers of RollingStone Magazine? Why are there so many more men in popular music than women? And why are most of the women in popular music singers? Where are all the female instrumentalists? Do you want to see more women on TV being real women rather than over sexed school girls? 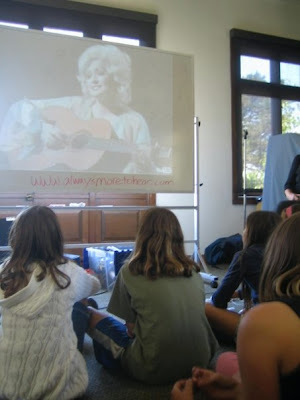 Aretha Franklin, Wanda Jackson, Joan Jett, Sleater Kinney, Queen Latifah, and Bjork: these are someof the famous woman that Girls Rock Camp (GRC) uses as role models. But GRC also seeks to shine the light on every day role models: our cool sisters, the girl next door and the band that plays in that small club on Fridays. This Saturday, July 11 at 2pm at the Metro Oakland Opera House you will be able to see the 70 or so girls perform their original songs that they will write with their bands this week. Whether or not they ever pick up these instruments again, GRC hopes to inspire each and every one of them to be powerful and true to themselves. I highly recommend that you pencil this show into your weekend. You will not regret it. I usually spend the whole two hours smiling with tears in my eyes. It's amazing what these kids can do in a week.